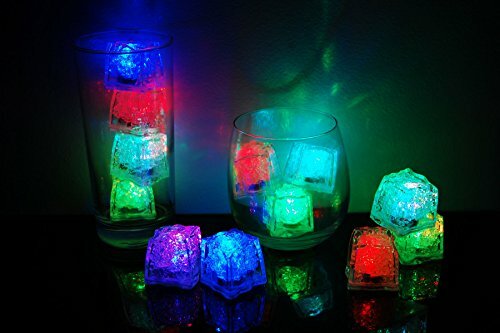 Light up the night with our assorted glowing ice cubes. 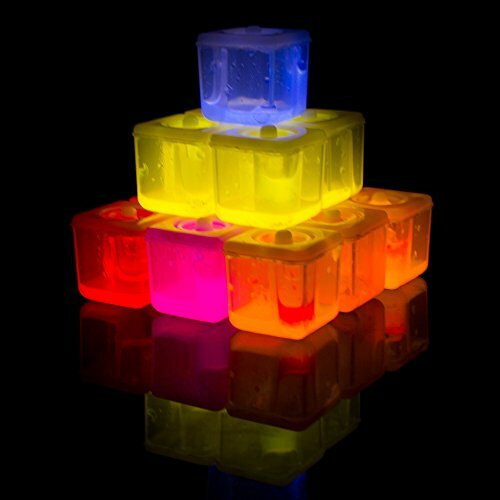 Our 1 inch Glow Ice Cubes are one of the hottest light up drinkware items! To activate, simply squeeze to snap the stick on the bottom, and shake. Glow ice cubes will glow for 6 Ð 8 hours. One time use only. Sold 24 per pack. Get ready to have the most illuminating drinking experience imaginable. 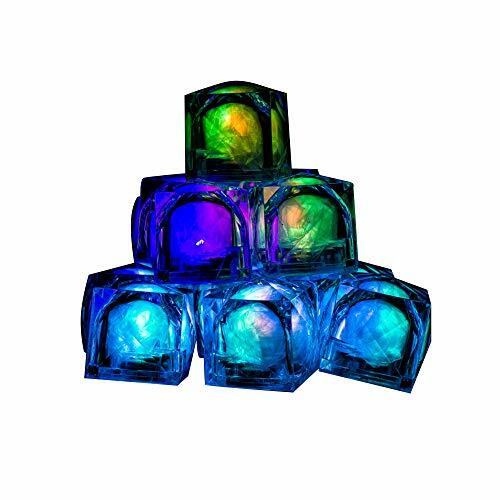 Our novelty LED ice cubes are made of clear plastic and feature powerful LEDs that flash and blink, turning any drink into a glowing work of art. Even seltzer water becomes fun. These vibrant cubes are also great for home decor. Place them into a vase of flowers--or just in different spot around your hope where you want some pleasant mabainence. Place them into any cold or room temperature drink --that you can enlivening any dull container into a wildly colorful display; add to a transparent glass for a pop of color and vibrancy. Simply engage the on button to watch these ice cubes fill with color. Batteries come included and are replaceable. 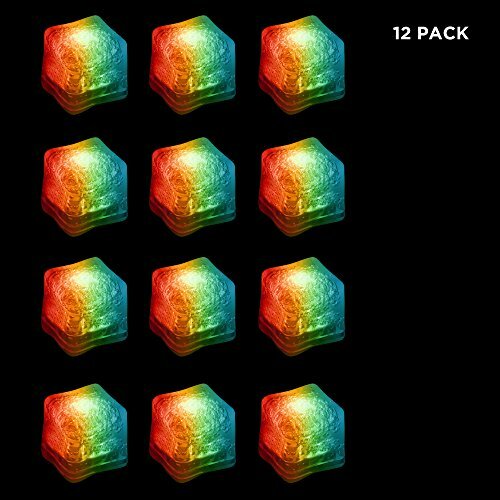 This pack includes 12 LED ice cubes that make great party favors, handouts, prizes, or incentives. 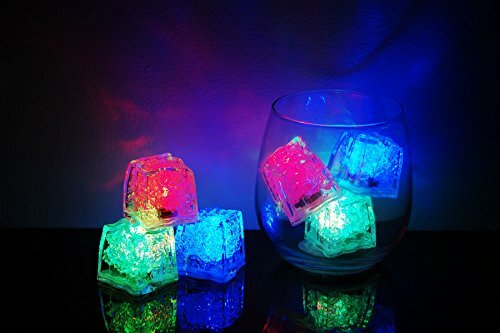 These LED ice cubes make any occasion better. They measure 1.25 inches wide and are made of FDA-approved plastic. Press the button on the bottom of the cube to turn on, off, and to cycle through the 8 modes, including color-changing, and 7 solid color modes. Batteries are included and installed. Batteries are not replaceable. 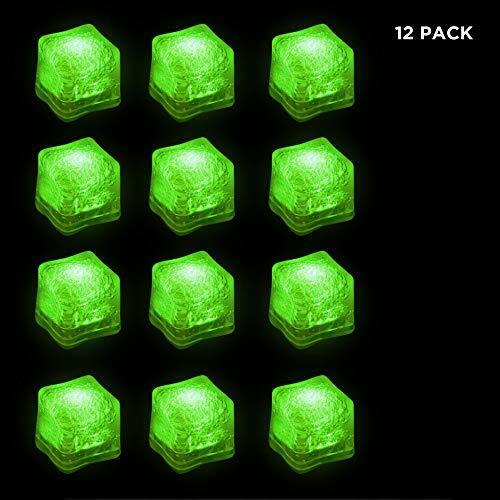 Each pack includes 12 LED ice cubes. 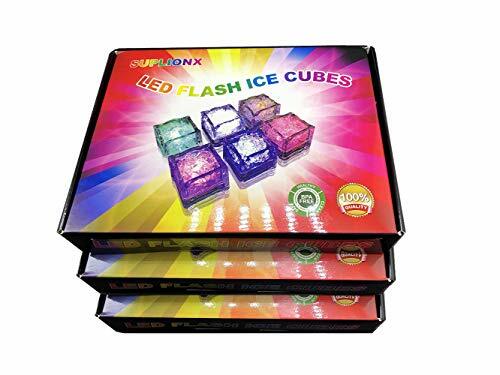 Featuring 8 different color modes (red, green, blue, yellow, aqua, purple, white, and a combination of all) our 8 Mode LiteCubes are the most versatile and popular LED ice cubes. With a variety of colors to choose from, you can tailor your event to the colors you want. Made from a non-toxic FDA compliant, freezable gel sealed inside of a light cube, our safe and durable LiteCubes are perfect for drinks, spas, flower arrangements, and more. LiteCubes can add a new dimension to your holiday gatherings, romantic settings, and make you stand out in trade shows. All of our LiteCubes can be customized with text and graphics for an additional fee. Contact us for details. Beer, wine, booze, soda pop--no matter what you drink, it can get boring after a while. Call it beverage burnout. Well, there's a light at the end of the tunnel, literally. That light comes in the form of our Green LED Ice Cubes. These clear plastic cubes feature powerful LEDs that flash and blink, transforming any drink into a beverage masterpiece. We offer a wide selection of colors. Drop the LED cubes into a glass of plain seltzer--or any drink--and prepared to be dazzled. Flexible neon wire, EL wire, also called eletroluminescent wire is the new generation product in global leghting and display industry.Wrapped by colorful plastic tube on its surface, it appears similar to common phone wire, emitting light alonge its entire length.Great for car decoration, parties, camping, bar decoration and so on.With car charger driver, just plug into your car lighter charger and glow. For CALIFORNIA residents only: WARNING: This product contains chemicals including DEHP, which is known to the State of California to cause cancer and birth defects or other reproductive harm.Please note that by posting this Proposition 65 warning, we are notifying you that one or more of the Proposition 65 listed chemicals may be present in a product. With Unique Bargains' products, the exposure to these chemicals may be of no significant risk to you, but out of caution, we have elected to place this warning on our site to make sure our customers are informed.You can find more information at http://www.oehha.ca.gov/proposition-65/about-proposition-65. Water Ice Frost Nature Winter Stream Rock Glow Poster Print 24 x 36We stand behind our products and services to deliver to your doorsteps within the promised delivery window. We appreciate your business for any questions or concerns please contact via email. 24 Ice Palace Glow in the Dark Glass Twisted Icicle Christmas Ornaments 5.25"